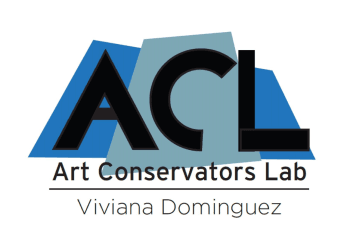 "Viviana Dominguez is a gifted and unique art conservation professional. She brings decades of diverse project experience, travel, teaching and study to her work. In addition to her conservation of works of art at The Broad Art Foundation, she has performed excellent conservation projects for institutional and private clients around the world, particularly in her specialty of easel and wall paintings conservation, and I recommend her highly." Chief curator / Director of "The Broad Art Foundation"
Viviana Dominguez is a true professional as witnessed in her conservation skills and in her work ethic. I had the pleasure of assisting her on a group of paintings that I hired her to conserve; she was a patient and thorough teacher. She was extremely knowledgeable, explaining the terminology as she worked diligently. Although her time management skills were remarkable, she devoted extra hours to complete a painting that sustained major damages. The results were amazing—only a trained eye would be able to see the repairs. She's such a joy to be around that we've become friends.